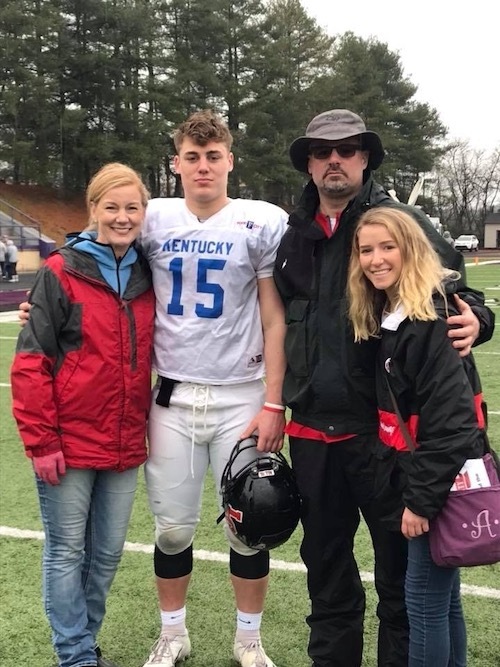 SEVIERVILLE, TENNESSEE — Lawrence Co. football star Noah West played in the 12th Annual Food City Border Bowl and was fantastic as he helped Team Kentucky absolutely wear out Team North Carolina 50-0 Saturday afternoon at Sevier Co. High School. West proved once again why he was one of the best players in the Bluegrass state and that East Tennessee St. University got a steal with his ability to play multiple positions. West was dominant in the game with 3 Rushing Touchdowns and 1 reception along with some outstanding blocking. He was also named a team captain by his Coaches prior to the game. The game was Televised on ESPN 3. Noah being interviewed by ESPN during the second quarter.